On November 28, Jane Riddell, Chief Operating Officer and 30 year veteran of GoodLife, addressed a packed room of IABC members and guests, in the stunning new GoodLife office building. 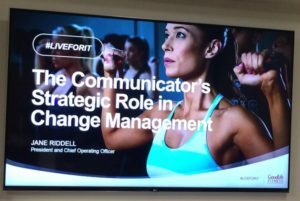 Her presentation, “The Role of the Strategic Communicator in Change Management,” focused on how the Communications Department at GoodLife managed and prepared for the most significant changes in the history of GoodLife, over a period of 18 months. Riddell began by describing how she started working for GoodLife at its inception in 1979, when David Patchell -Evans, founder and CEO of GoodLife, bought a male-only fitness club and converted it to a co-ed club to make fitness more accessible to both men and women. The GoodLife club was a pioneer in the fitness industry in many ways, focusing on health and making the members feel empowered, by helping them believe in their own capabilities. The recent change came as a result of the rapid growth of the company not being supported by experienced or trained leaders. The company made a conscious decision to invest in the growth of people and technology, by implementing four new technology systems across Canada. The aim of the technological changes was to improve the member and associate experience, empower leaders, and support Canadians on their fitness journeys. Planning for and implementing the changes meant having the executive on board to support the public relations and communications team, share information with employees, serve as role models for the changes, offer feedback during the change process, and facilitate the change process for the communications team, by giving them the space to make mistakes. The internal communications team, in turn, focused on consultant Robert Harris’s 4-box Model of Strategic Influencing, which addressed the need for change, the benefits and implementation of change, the identification and minimization of concerns and identification of what was being preserved in the process. With these strategies in mind, the communications team mirrored business and project plans for each change, created the necessary tools and resources, and elicited multi-stakeholder feedback. Both the PR and communications teams collaborated to provide consistent counsel to the executive team, and to identify and manage risk. The communications team was at the executive table from start to finish according to Riddell. The communications team selected the Edelman agency to assist with media training, strategic counsel and feedback, SWOT analysis, and messaging development from an external perspective. Having the additional expertise and resources of the Edelman team was key to managing the changes affecting a large number of employees and stakeholders – especially when downsizing. “We provided career counselling for those who could not stay with [GoodLife],” Riddell said. Riddell pointed out that, in addition to listening and having frequent communications with GoodLife employees before and during the changes, being firm about realistic timelines for change was crucial. She says that the communications team was pressured to deliver quick results, but the team resisted efforts to speed up the process. About 80% of staff understood what was happening during the downsizing, and it took time to build that understanding. Best practices for communications practitioners when navigating change, according to Riddell, included informing leaders first, and role playing/dress rehearsals in preparation for communication of key messages. Short key messages were tailored to each audience to avoid overwhelming employees, and it was important for communicators to know the information well enough to be comfortable sharing it in their own words.